Here is a story that Dr. Gary Bradt likes to use when he speaks about Adapting and Igniting — Turning Change into Opportunity. 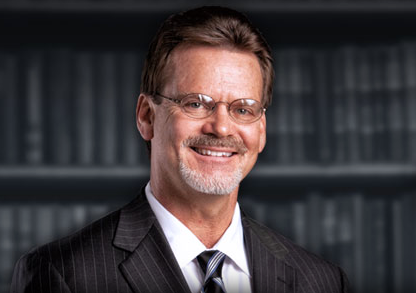 Dr. Bradt is an author, clinical psychologist, leadership consultant, C-Suite executive coach and a speaker. It’s a story about a man named Richard. Back in the mid 60’s, Richard was a successful entrepreneur in the upper midwest of the United States. He broke away from his family business to start up his own business. To fund it he took a mortgage on his house. The new business grew into a chain of 8–10 equipment stores named ‘Sound of Music’ that later expanded into selling electronics like TVs, Stereos, etc. It took him some time to figure out how to become profitable but eventually he managed to do so — his business model was working, he made money and everything was good. One day a tornado came to Richard’s town, turning his life upside down. The tornado damaged his largest most profitable store and almost all of its inventory. He was in trouble — his business could go bankrupt if he didn’t manage it correctly. How Richard responded was the point Dr. Bradt wanted to demonstrate in turning change into opportunity mantra. Richard gathered his team around the table and said: “Folks, we have got a tremendous opportunity here”. His people, still in shock trying to comprehend the damage, said to him “What are you talking about? What opportunity?” and he said, “This Tornado is allowing us to do something that we could never do before”. Richard suggested making a “Tornado Sale” — they took all the damaged inventory, fixed it up as much as they could. Now all they had to find is a place to sell it. Since the store was ruined — one of them suggested using a big warehouse where people could take what they wanted right from the shelves, unheard of at the time. They took the risk. “You must face some level of a risk to change”, said Dr. Bradt. Richard and his team took an even bigger risk applying their advertising budget for the rest of the year, into this one sale event. They plastered the town with signs, billboards and placards. On the day of the big sale, Richard looked at his parking lot and saw a long line of cars. Surprisingly it turned out to be the most successful day of sales in the history of the company. It was so successful that they decided to do a “Tornado Sale” every year even if there was no Tornado around. “Richard is not a dummy”, says Dr. Bradt, “He told his people that ‘Just because the way they have been doing business up until then didn’t work, does not mean there isn’t a better way’. They permanently changed their business, after a couple of years of selling hi-end products in traditional stores, to a permanently discounted warehouse model”. The new model was the superstore format — 18,000 square foot stores, with low prices everyday and above all a heavy advertising budget. Today the Best Buy chain has 13,000 branches all over the globe. Richard is one of the most well-known businessmen in the US, Richard Schulze, the founder of the chain. Changing the Operations and Infrastructure of an organization into adopting a culture of DevOps can be a massive undertaking. Considering the scope and size of the required changes, in terms of Best Buy story, it could be some kind of a “Tornado” for an organization mostly because it has to change the basic core of the way people used to think about infrastructure. There are many enterprises that adopted DevOps culture for their organizations several years ago. These organizations would testify that continuous delivery reduced their costs, shorten the time to market delivery and enabled faster and more stable delivery to the users with reduced risk of failure. Netflix, Amazon, Google, SAP, Etsy, HP, Flickr, Quora are just a few in a growing list of enterprises who adopted the DevOps practices right when it all started. According to Google “On the Google Consumer Surveys team, 8 minutes after you commit code it’s live in production”. At Amazon, at least according the statistics, they have shared in 2012, they deploy a new software to production every 11.6 seconds on average and at times made up to 1,079 deployments in a single hour. But DevOps transformation is not that easy, unlike the Best Buy story where the damages the tornado had caused forced Richard to change his way of thinking, the metaphoric tornado of DevOps transformation is not that tangible, there is no clear deadline or urgency. In fact, the organization itself is the one to decide if and when transformation should take place. What makes the change significant is the operational complexity, the sheer scale of disciplinary change and often existing geographic dispersion of enterprise teams. Changing discipline, choosing new tools and gaining a lot of new knowledge in a short period of time is no easy task. Just the thought of replacing infrastructure components in a way that would not stop or disrupt the service to users is quite challenging for companies who think about adopting DevOps practices. Before DevOps practices “were born” there were several complementary disciplines that weren’t necessarily connected or worked in parallels such as developers and infrastructure operators. As a result of the communication hardships, often a life cycle of a product, especially the development and implementation, could take few months and even a year or two. DevOps practices not only shorten that time but slice the delivery of value to customers into smaller pieces that bring benefits in a more immediate return to the business. One famous example is the HP LaserJet Firmware team, who re-architected their software adopting continuous deployment practices. Even though printer firmware is not delivered as a service, the process they changed into is considered to be fundamentally DevOps. Back in 2006, HP LaserJet team completed two software releases per year, the majority of their working time was spent on porting their code to new products. Observing statistics from that period displayed an amazing metric — only 5% of development time was spent writing new features. A significant portion of time, about 15%-20%, was spent on a redundant non-value adding activity such as integrating their code into mainline. Implementing a practice of continuous integration started a dramatic change moving all developers onto a common code base instead of code branches for each different LaserJet model. This took time and was not that easy but eventually made the build cycle time vastly shorter, from one week in 2008 (and 1–2 builds per day) to 3 hours in 2011 (10–15 builds per day). Improving from a single code commit per day to a hundred commits. Reducing regression tests from a 6-week cycle to mere 24 hours. The time spent on writing new features improved from 5% to 40% and overall development costs were reduced by 40%. Taking the “turning change into opportunity” perspective to our constantly changing digital world was one of the main subjects on the annual Gartner IT Operations Strategies & Solutions Summit 2015 held in June in Orlando, Florida, US. The question ‘Are you prepared?’ was hanging above the summit entrance, highlighting the preparation businesses must do in the era where digitalization redefines the future. The crowd attending the summit were mostly managers and directors from banking, finance and insurance sectors as well as from the technology and telecom sector. “Delivering business value is now high-priority, and top-to-bottom transformation of people and processes is crucial to success”, according to the Gartner report that summarizes the summit where the agenda was to “explore ways to make agile thinking to be part of the organization culture and the role of automation in I&O. In addition, attendees walked away with a better sense of how to make both their service portfolio and catalog deliver real business value while gaining insights on I&O leadership”. Throughout the summit, the audience and members were asked for their insights. 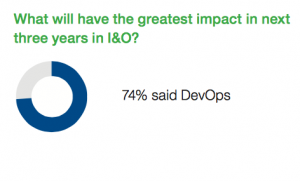 According to attendees, the greatest impact during the next three years in Infrastructure and Operations fields is DevOps (74%) and the greatest challenge needed to implement it in their organizations would be having the right people. 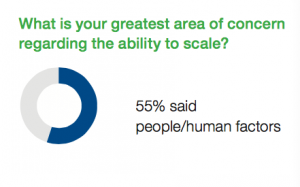 When asked about their concerns regarding the ability to scale, the human factor was raised again — 55% have said their main concern regarding the ability to scale is people/human factors. When asked which part of their operations they believe needs to change first 55% said, people. 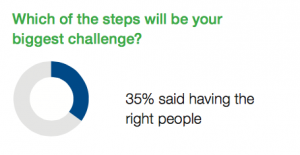 And when asked what they think is the biggest impediment to a successful DevOps project again 39% said the people and the cultural changes. “We are entering the third era of IT, full of new business opportunities: digital business moments, digital commerce moments, human moments”, said Chris Howard, Vice President and Distinguished Analyst at Gartner, “Machines and things are increasingly active participants in complex interactions. 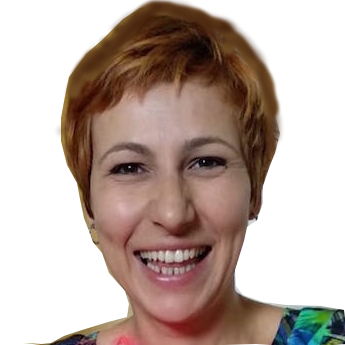 New business outcomes demand designs that foster democratic solution delivery and fluidity”. “Infrastructure and operations do a great job to keep the lights on for the business, but that’s not enough”, said Donna Scott, Vice President and Distinguished Analyst at Gartner. “With 70% of CEOs focused on business growth and 83% of them investing in digital business by 2019, now is the time for Infrastructure and operations to re-think its role in growth and innovation. Infrastructure and operations must make time for innovation but also develop a charter for innovation, along with expectations and results”. The story of Richard by Dr. Bradt clearly exemplifies that change always creates opportunities, but it is up to the organization or the leaders to find them. The first step is to believe there are opportunities out there and from that point, focus on capitalizing on it. “A leader’s job is to help people get comfortable being uncomfortable”, Dr. Bradt said at the summit. “Every change creates opportunities. Your job is to find them. Adapting faster and better to change isn’t a luxury. It’s a necessity. Whoever adapts faster and better wins”.